More Valentine’s and Meeting Online Friends! Hello, I have another fun Valentine for you this week! 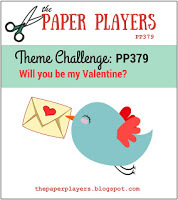 It’s for the Theme Challenge over at The Paper Players. This Text Ya Later set is from Stampin Up and boy do I see many possibilities of future cards with this fun Stamp set. Sorry for the startling bright photo. I am playing around with the camera set up and it’s still a work in progress. I incorporated some other SU sentiments onto this card in order to achieve my Valentine greetings. Before I go, I had the pleasure of meeting in person one of The Paper Players talented Team Members yesterday (who always so happens to be on Seize the Birthday with me.) Sandy Mathis and her hubby were driving right by my area yesterday, so JoAnn Burnham (who also is on STB with us) and I met up with the pair of them. It’s times like these that always makes me feel grateful for this Hobby of mine! Thanks so much Sandy and Bill! It was a pleasure to share a meal with you both and meet you in real life! JoAnn, it’s always nice to see you too! Next time, we have to do some shopping and stamping too! HUGS to you all! I am also linking my card up over at Addicted to Stamps and More for their Holiday Challenge! Categories: Cards | Tags: Card making, Cards, rubber stamps, stamping, Stamping Up, Valentines Day | Permalink. 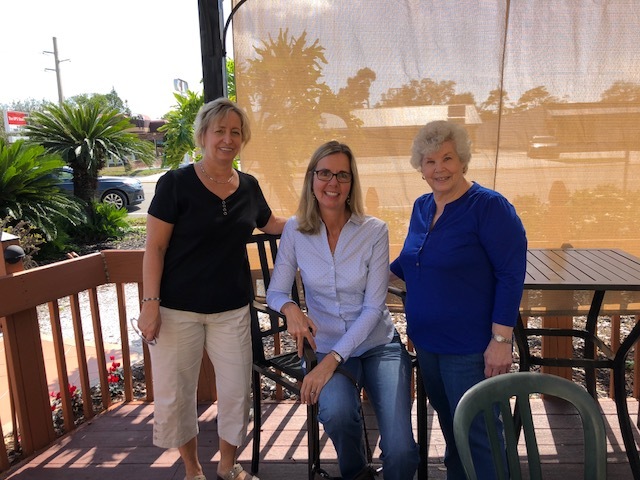 I was hoping I would see a picture of you three…so glad you had time to meet up! Your card is lovely, such a fun combination of papers and images! Thanks for sharing this with us at the Players this week! Love your Valentine card and all the fun details. It was so nice to meet with you (as always) and also meet Sandy. I agree that this hobby helps us to meet so many nice friends and it is always nice to meet them in person. Have a wonderful day my friend. Love all the layers…great design! Thanks for playing along at The Paper Players…so happy you joined us! Beautiful card. Thank you for joining at Addicted to Stamps and More and waiting to see next time.